Adventure #26: Mt. Rainier Splat – Hi, Alpine. Sheer contentment. Robin and I were stretched out on a gently contoured rock that was still warm from the day’s sun, watching the stars and moon come up over Mt. 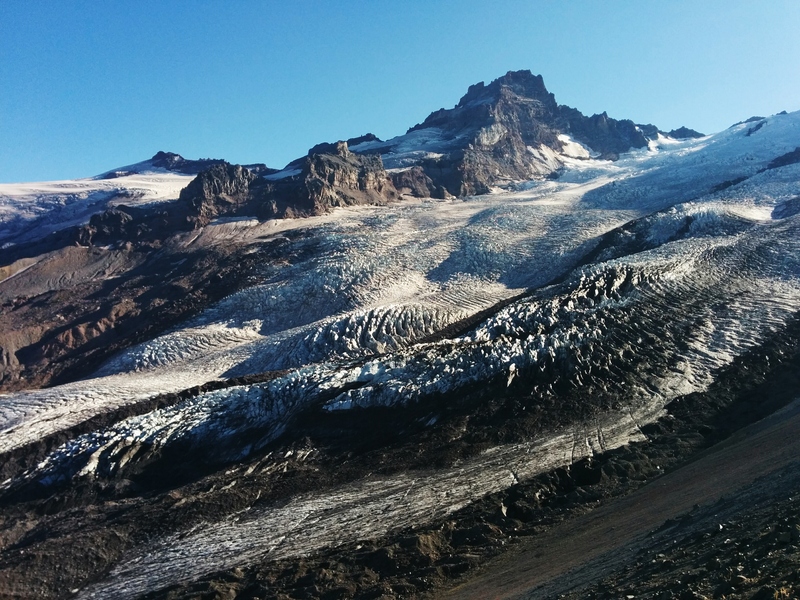 Rainier’s Glacier Basin. The edges of the giant bowl rose up around us while the meltwater creek rushed by, an empty expanse except for one lone figure ambling our way, likely coming to spy the moon himself. The dayhikers had long since returned to their cars, and the only ones left were us and two other overnight camps in the tiny three-space Glacier Basin campground. “Aw, is that bourbon? I’ll give you $8 for a taste of that.” Thus started pleasantries of a type that seem unique to evenings spent in the mountains with a certain type of person: instantly familiar, warmly conversational, and bonded over an unspoken understanding that you’re both on the same page regarding the wonder in experiencing something greater than yourself. Robin told the gentleman that under no circumstances would we accept money for a drink, and he poured a sampling of our Evan Williams into the man’s empty water bottle. Elated, the man thanked us and invited us over to his camp for cheese and crackers, then hoofed it back to share this new found fortune with his wife. Robin and I settled back into the rock and watched a few more stars make their debut, when we heard footsteps once again. Our new friend had returned, and bestowed upon us two brown paper napkin parcels. “We wanted you to have the last two,” he explained. “And my wife was yelling at me going ‘Why didn’t you bring the Crown Royal? '” We opened the napkins, and each enjoyed a Triscuit and generous hunk of colby jack cheese. This may not sound like much against a backdrop of refrigerators, grocery stores, and readily available takeout, but change the context to a mountain basin in the middle of nowhere and a sudden treasure of crunchiness, salt, and fat was pure heaven. It was our turn for profuse thanks, and again wished each other well and to have a beautiful evening. We had set out that morning for a three night trek around the northeastern quadrant of Mt. Rainier, our first visit to this particular park. It was kind of a loop, but with lots of arms and out-and-backs that read more as a splat than a standard loop or lollipop. Due to Mt. Rainier’s status as a National Park and all of the extensive permitting and reservations hoops that come along with it, we’d semi-randomly cobbled together our route months before when the lottery window for permits opened. Our itinerary involved a first night at Glacier Basin, connecting the Burroughs Mountain Trail to get to Granite Creek for the second night, doubling back then spurring off down into Berkeley Park for the third night, before doubling back again and completing the “splat” by following the Wonderland Trail back to the car. It was an admittedly odd loop, and the long-suffering Ranger in the check-station confirmed this with a grunt as he prepared our permit. To our left, a woman attempting a walk-in permit had buried her face in her hands as she slumped over a giant map of the park. Her favored campground had just been nabbed in the computer as she was reserving, and she did not look like she was having a good morning. Our route may not have been sleek, but at least it was guaranteed upon arrival and our permit was secured without a hitch. 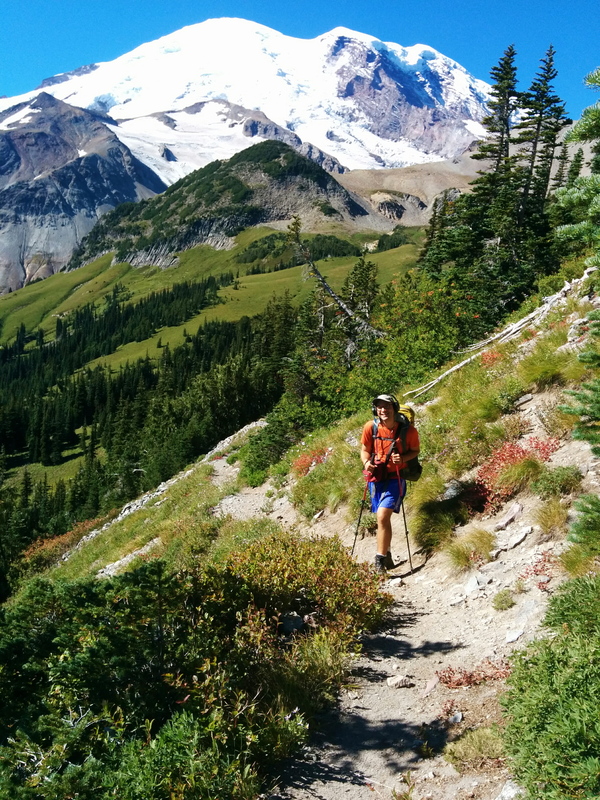 We started up the Glacier Basin Trailhead not 30 minutes later. Leaving from the White River Campground, the hike to Glacier Basin was a very short jaunt of about 3.5 miles. 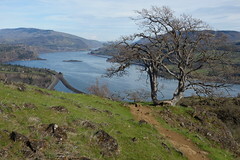 After a bare minimum of forest-obscured views, the trail came out with guns blazing and delivered incredible views of Mt. Rainier the entire way up. We sounded like a pair of broken records with the profuse, elegant utterances of “Oh my god!” and “Holy crap!” but we couldn’t help it — Rainier is a giant mountain and it imposed in a way that we hadn’t experienced before. The grade remained gentle and the trail quality ridiculously nice, except for the last leg which angled sharply up before delivering most of the hike’s elevation in around a half mile. Oof. With such a short trip in, Robin and I made it to camp quite early in the day and had our pick of campsites. We set up, took a brief rest, then headed off for a day hike to see what there was to see. We crossed the headwaters of the White River and poked around trying to find an unofficial trail up the side of the basin. 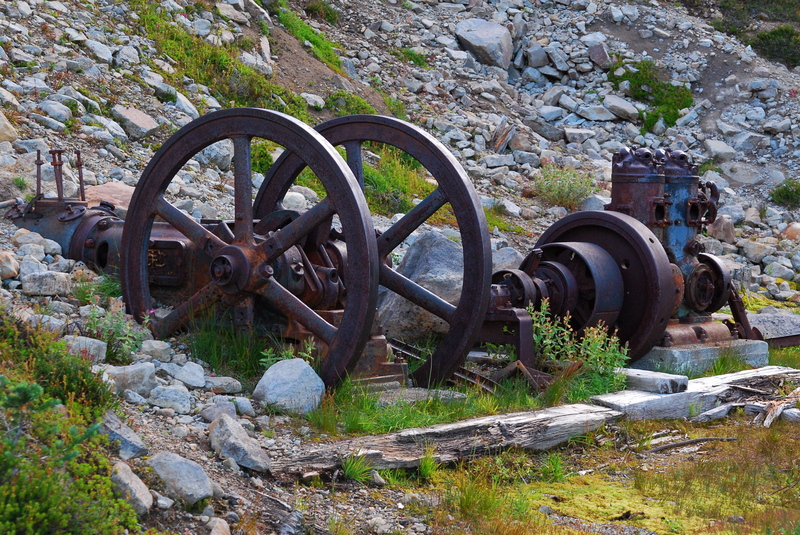 Along the way, we came across a large array of rusted steam equipment up the hill from the creek. The hillside was littered with the ruins including some kind of engine, warped tracks leading to nowhere, and a rusted mine cart whose sides had folded in on themselves leaving it flat as a pancake, likely from a hundred years under the weight of snow. Many of the pieces were in incredible condition, while others were half consumed by a moss marsh that also tried to swallow Robin’s ankle when he mistakenly took the moss for a solid surface while trying to get a closer look. When we got home, Robin and I did some research on mining activity around Mt. Rainier and discovered that we had stumbled upon the ruins of the Storbo mine, which has quite the colorful history and is well worth the read here. Already satisfied with the day’s surprises, Robin and I picked up a trail that appeared to switchback straight up the basin wall. I shortened my hiking sticks as small as they could get and we proceeded to cleave and scramble our way up the scree in tight, steep whip turns. It was a very direct route to the top, to say the least. The “trail” spit us out at the base of a more gently rising rock and scrubby grass plateau that swelled up to the ridge’s far edge. If this was all the further we’d gone, the views were worth it as we looked down on the tiny White River, the tuft of pine trees hiding our tent, and a direct view down the valley we’d hiked up. We were high enough to see the other peaks and ridges fanning out from Rainier’s center, and could spy well-defined paths snaking across the whole terrain. 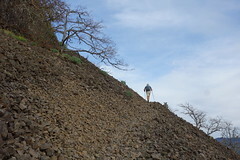 The existence of unknown trails was intoxicating; this first view only hinted at the phenomenal size of the mountain and trail network. As is always the case, Robin had bounded ahead of me as soon as we reached the plateau, as if the mountain was the moon and he was a lovestruck moth. When I met up with him at the ridge’s crest, there weren’t words. The view looked down onto the Emmons Glacier, a glacial flow of unbelievable size with stacks upon stacks of frozen pinnacles lording over deep crevasses, all bunched up in pristine icy rows. I couldn’t get over how old it looked, this frozen relic that certainly melts and changes somewhat with the seasons, but whose core had been holding court on that mountainside for an imperceptibly long stretch of years. I suddenly felt very small, and the alpine spider (uncommonly large) sitting next to me surely agreed. We kept the glacier company for awhile, then headed back down to camp. Along the way we encountered the fattest marmot we’ve ever seen trundling around no doubt looking for some dusk-time adventures, and it was a crime that he didn’t have a monocle and top hat. Adorable. After dinner in the basin meadow, we put on our warm puffy coats then stretched out on a comfy rock with a bag of lemondrops and a flask of bourbon, and that about returns us to where the story began. Having glimpsed teases of trails grazing the tops of surrounding ridges on our dayhike, Robin and I set out eager to get going on the second leg of our trip. The Burroughs Mountain Trail was, again, sharp switchbacks straight up the side of the ridge (this turned out to be the theme of the trip; when all was said and done, we figured we gained and lost 10,000 total feet on this trip), which at least was nicely shaded until the trail suddenly straightened out and released us in an alpine meadow. This dramatic view had been shrouded in trees the whole trip up, and I hadn’t realized how high we’d climbed. Words fail to describe the view, but this photo of Robin looking giddy with alpine fever helps. Needless to say, as the trail snaked up the last stretch of the ridge and away from the mountain, we were turning around every 20 feet to gawk. 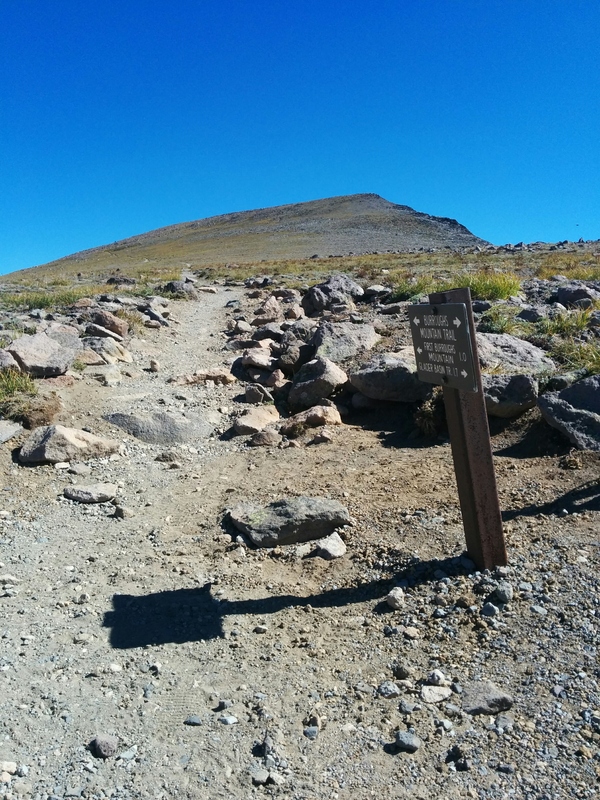 We reached the saddle between the central and western-most humps of Burroughs Mountain. Robin forked off to get to a peak on the western one and see the views, while I waited by trail junction. I waved at a trail runner headed in Robin’s direction, the first other person we’d seen all day, which struck me as odd since we had yet to experience the epic density of people we expected with National Park status. The saddle was a rocky, wide-open expanse with 360 degree views. I could see dots of people coming in the distance, so I set down my pack and carefully stepped about 10 feet off the trail to sit down, get out of the way of oncoming hikers, and have a snack while I waited for Robin. I am extremely fussy about going off-trail and can be painfully slow due to my inability to step on plants and hypersensitivity to contributing to over-trodden areas. This detail is important for what comes next. Two people approached trail fork, and one in a National Parks Service hat called me over. The man in his 70s bore a hat that had “Volunteer” embroidered in gold, but he conducted himself more like puffed-up park service police. I got a very stern warning about going off trails, and before I could respond to explain my extremely cautious and responsible philosophy about off-trailing, he requested I tell him where I was camping. The phrasing of this as a command rather than a question seemed unnecessary. “Well, you must be mistaken,” he countered. He proceeded to tell me that my itinerary was wrong (!) because if I had started at Glacier Basin, it would be both too difficult and too far for me to get all the way to Granite Creek. There was a bizarrely gendered implication in his rationale about what my personal ability level was, and as he worked out the itinerary I must have meant to say, I felt as though I was being told to stick to the easy hikes with the rest of the girls. Tired of arguing with him about the ease of a six mile hike, I pointed to Robin in the distance and told the volunteer to look at our permit, which would confirm our destination. At the mention of the phrase “my husband,” the volunteer immediately backed off. The change in tone was abrupt, and I pictured those dishsoap commercials where a drop goes into the water and the grease aggressively recedes. His wife, also in a volunteer hat, seemed embarrassed and smiled at me, ignoring her husband’s inquisition and stating what a beautiful day it was. She was delightful, and we exchanged enthusiasm for the area before they moved on along the trail. I sat and processed the interaction. What bothered me wasn’t the off-trails comment — the National Parks get an inordinate amount visitors and telling people to stay the course is perfectly fair — but the patronizing lecture about my perceived abilities stung. Over the course of the summer, I had experienced an odd variety of casual sexism on the trail ranging from male hikers ignoring me and only talking to Robin, comments from men such as “I bet your husband has to stay ahead of you so he can get your bubble bath ready to make up for dragging you camping,” and, when stopped alone, women asking where my hiking partner is because the wilderness is “no place for a woman alone.” Robin, who usually hikes about 10-15 minutes ahead of me due to a speed difference, would marvel at our vastly different encounters with the same male hikers and groups. On their own, the comments and experiences were easy to laugh at and shrug off with an eye roll, but stacked up by the dozens they built more heft, with a weird, pervasive message about a female’s place, or lack thereof, in the wilderness. This volunteer had hit a nerve, and I felt my patience for the whole situation snap. For the rest of the trip, I would get to the tops of passes and mountains and deadpan to Robin, “Whew, what a relief that my woman legs could get up that! I thought for sure they’d give out.” Or, after consulting a map and heading down the trail, “It’s a good thing you were here, Husband, to help my womanly lack of direction.” Joking helped. But for real, folks, please don’t make comments assuming ladies don’t want to be outside and don’t know what they’re doing. And pink shirts and giant drugstore rhinestone sunglasses aren’t necessarily an indicator of ability. After Robin caught up with me, we headed over the central Burroughs Mountaintop and were stunned to be confronted with hundreds of people; I had flashbacks of my high school National Park family roadtrip and what Yellowstone and Glacier were like in high season. Within 3-6 miles of certain trailheads, it becomes a little like Disneyland, but as soon as we dropped down and swooped past the Frozen Lake trail junction and joined the Wonderland Trail, the crowds immediately thinned. The trail lined the inside of an enormous basin with Rainier looming above the Burroughs rim that was now above us to the left, with the scooped out emerald tones of Berkeley Park valley to our right. This grassy stretch was home to several marmot families, and we just about died when two juveniles posed for us with a kiss. Let us pause here for a moment. 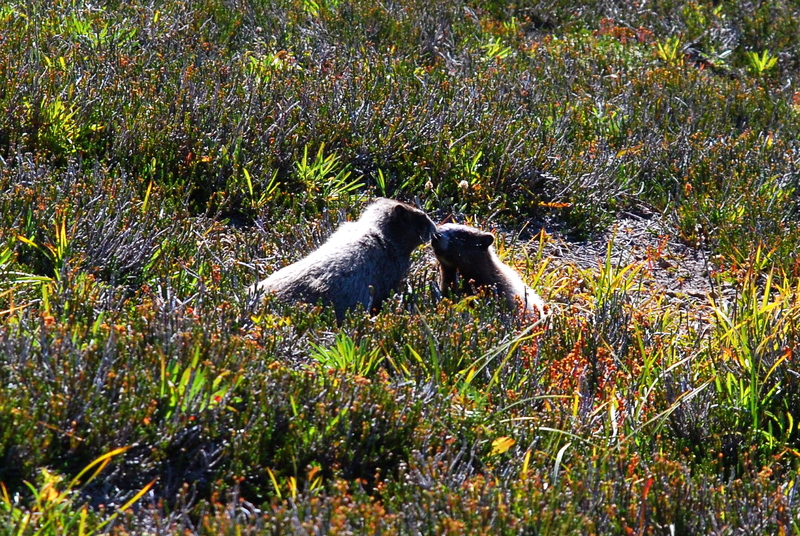 Kissing baby marmots! Come on. My heart was suddenly two sizes too small for that kind of thing. As had become the theme for the trip, the trail began to climb out the other side of the basin an reclaim the elevation we’d lost — again. And because we weren’t feeling crazy enough, we reached the top and opted for a quick side trip up adjacent Skyscraper Mountain. The 360 degree views at the top were absolutely worth it and as we sat upon the crumbling rock pinnacles and mountain goat dung, I momentarily felt invincible. This day had undoubtedly been the most elevation gain and loss in one day I’d ever done and felt high on personal achievement, adrenaline, lack of oxygen, and M&Ms. With the sun low in the sky, we banged out the descent to the Granite Creek campground as we lost even more elevation down the other side of the ridge, and after five excruciatingly long switchbacks found our spot. Our site was #3, nestled all the way back in the woods away from the other sites. A clearing in the trees left a view of Rainier’s snowy cap visible while we cooked and ate dinner, and it was better than any TV as we watched it turn a bright pink, then rose, the faded mauve as the sun slipped away for the night. As we drifted to sleep in the tent, the last thing I saw through the mesh were the glacier’s shifting blue tones reflecting the ambient light of the night sky, an abstract milky mass cloaked in black. The third leg of our trip was half repeats, and the oddness of our itinerary hit home. Before turning around and slogging back up the previous evening’s switchback, we refilled our water in in Granite Creek, which, incidentally, is one of the most beautiful creeks we’d ever seen. Freezing cold, crystal clear, cascading out of ferns and moss and decaying trees into lazy lagoons, chortling over rocks, etc, etc, the sort of place where fairies and gnomes could appear tossing around handfuls of pixiedust and you’d just nod your head and go “Yeah, that seems about right.” It’s like that. 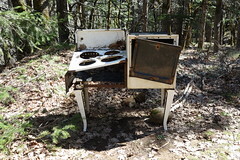 And after a few days on the trail disconnected from the rest of civilization, the tethers to reality tend to soften just enough that the impossibility of mythical creatures seems a tad more tenuous. I powered my way back up the pass fueled on European fantasy metal. During the monotonous stretches that are short on views and long on burning thighs and sore feet, it’s hard not to get swept up in bands with names like Gloryhammer, Battle Beast, and Powerwolf — epic stories and epic riffs for epic scenery make the miles fly. And yes, I did get caught singing/wailing air guitar solos once to “The Unicorn Invasion of Dundee” when some guy startled me at the bend in a switchback. Whatever. It’s my ace anti-bear tactic, and so far it’s working splendidly. We backtracked past Skyscraper Mountain and the amorous marmots again, meeting up with a four-way fork in the trail from the day before. We turned left and began dropping into Berkeley Park, a grassy valley studded with evergreens that provided an increasingly dramatic view up at the rocky valley walls on either side. We were in late season September and the blink-and-you-miss-it alpine summer had taken a turn towards fall. The grasses wore a yellow cast and most wildflowers were reduced to brown, soggy seedpods and barren stems rising out of the meadows. That lovely scent of damp, slightly decaying leaves filled the air, except for by the creek that the trail followed, which hadn’t gotten the memo and was a defiant slice of pure summer running through the autumnal landscape. 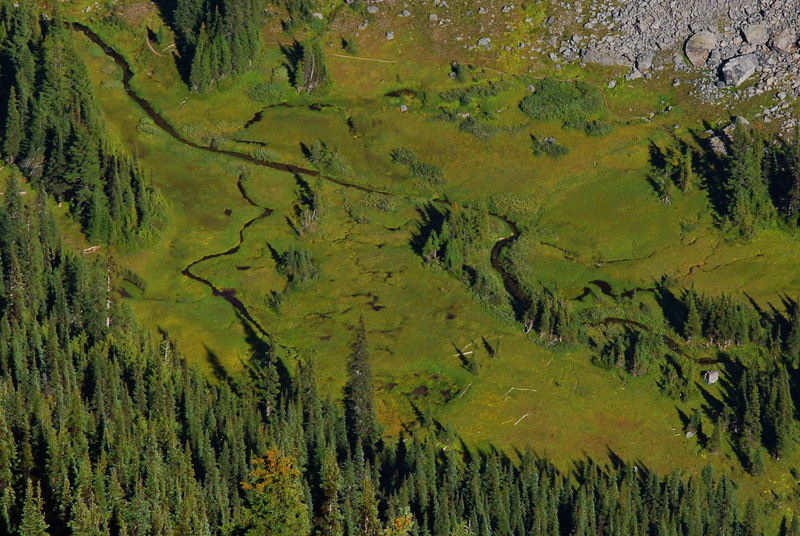 The grasses within a few feet of the water were still a bright, lush green and pink monkeyflowers and a yellow aster-looking things were still in full bloom; seasonal expectations be damned, the plants along the creek were playing by their own rules. Berkeley Park campground was only a couple miles down the valley, and we again nabbed a site set off by itself. Our low-mile day had left most of the day free to relax and we spent the afternoon creekside in the shade visiting with other hikers, taking photos, and studying the Rainier map to plot future hikes, next time with a backcountry permit instead. When dinnertime rolled around, we packed up our supplies and headed away from the tent site’s tree cover and headed for an enormous rockfall in an adjacent meadow to cook. 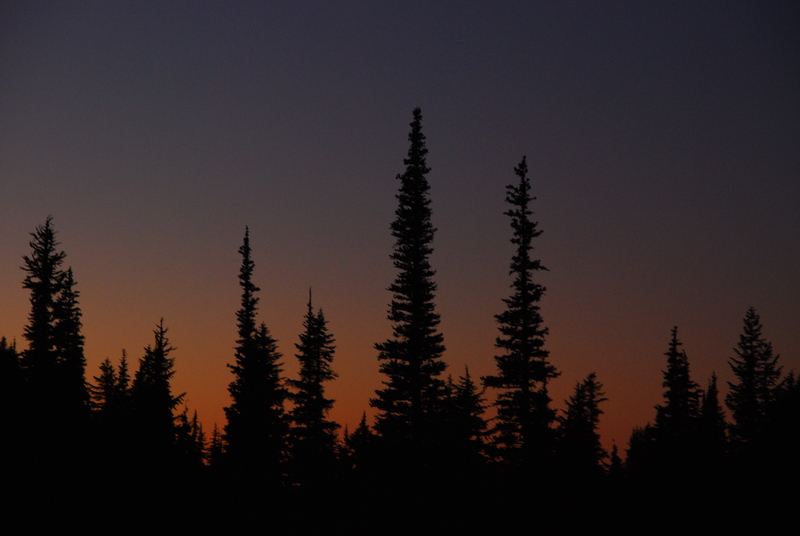 One thing to know about the official Rainier camping areas is that they’re generally in stands of trees, so the views possible from camp are more limited. Most nights we dined and cocktail-houred elsewhere, only returning to the tent for sleep, and our last night was no different. 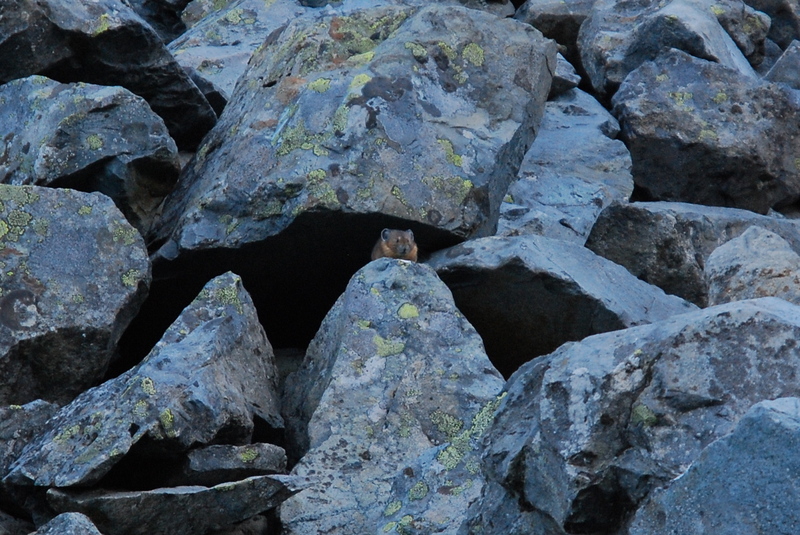 We cooked amidst giant boulders and were serenaded by a chorus of angry pikas who were ready for us to move on. The enormous rockfall cascaded from the valley wall above us and was comically large: some rocks were the size of cars, others the size of whole rooms. We felt Lilliputian as we perched atop a particularly large one while we ate and listened to the water moving through the marsh. For dessert, we passed a cup of huckleberries back and forth I had picked while Robin was cooking. They were the season’s last stragglers and extra sweet and potent from weathering a few frosts already. Some tasted like apples, others like blueberries, but all were delicious. My fingers were stained purple in a way only huckleberries seem to do. After we ate, Robin left to take the gear back to camp and trade out for some warmer clothes. I clambered up to the top of an even larger boulder, and sat alone and watched the dusk settle over the valley. Even the pikas had stopped their complaining and the silence was so absolute it felt almost heavy. Without the chronological notches camp tasks or conversation provided, sitting alone made time feel stretched out like taffy. 20 minutes felt like hours, and by the time Robin returned I felt like Rip Van Winkle, fused to the boulder and integrated into the landscape with lichen sprouting from my skin. Maybe I had started the trip as a thorn in the landscape’s side, an interloper, but by this last night I was fully absorbed and integrated. We lay there until while ink spread across the sky and the first stars wavered, finally sliding down the boulder and heading back to camp when the temperature started plunging more rapidly. Robin walked ahead and was soon swallowed up by the thicket’s darkness, but I paused to look back one last time on the dark meadow filled with ghosts of barely perceptible shapes. Thoughts of the next day’s hike out, drive home, and return to domestic matters of home and job started creeping in around the edges, but I quieted them down and willed them to wait. This last night was all ours to the very last drop, and the return to reality would just have to wait.